Patrice Covington has been seen all over the globe, belting tunes with all-star Broadway casts of smash hit shows and with her own original music. Her favorite performances include performing alongside American Idol’s Ruben Studdard in Ain’t Misbahvin’, as Effie in the Broadway National Tour of Dreamgirls, The Book of Mormon, and Motown the Musical. Patrice is honored to have been a part of the Grammy-nominated Broadway cast recording of Ain’t Misbehavin. Her latest feel-good single “Life Feels Good Right Now” is a dancy, poppy, happy, uplifting song that is available on iTunes and Amazon Music. Singer/songwriter Jamison Scott has been hard at work in the studio preparing the release of his full-length debut album. While the details are still a closely guarded secret, he tells us that it will be something of a country pop fusion. He’s taking time out of his busy music schedule and on-stage performances with the First National Tour of Motown the Musical to help countdown some of the biggest hits of the Motown era. Join us for a very special hour as Jamison, Patrice, and Dan each pick their favorite Motown songs by a male artist, female artist, and group. That’s nine amazing songs in one special episode of Kroll Call. Plus, there will be a tenth song that is destined to be a smash hit of its own. 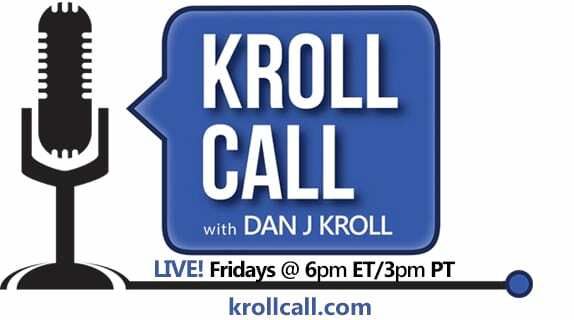 Kroll Call streams live every Friday at 6pm Eastern/3pm Pacific and encore episodes are available anytime on-demand at krollcall.com.